The primary focus I have on making your website a success is from being a professional internet copywriter. In a nutshell: “Words Sell, Graphics Don’t” Your words are the #1 key to longtime success on the internet. Your words on your website have to sellâ€¦ to be successful. 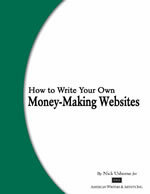 The secret is you are your best writer for your business website. You know your company, your products and/or servicesâ€¦ and most importantly your customers. There is no need to spend thousands of dollars on a professional copywriting, when you can learn how to write your own powerful copy for a fraction of that cost. Please allow me to introduce myself. My name is DJ Pierce. 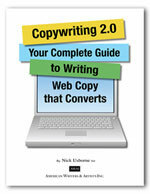 I am a professional internet copywriter and a successful online publisher. And I have decided to let you in on the best website copywriting products available for making your website a selling machine. I have personally read and used every product that I recommend on this site. I have literally taken every website copywriting course I could find- but I am only recommending the best internet copywriting products that will return many, many times your investment in your online business. Please feel free to contact me with any questions you may have about these profitable and powerful internet copywriting products.